After a friend of mine stayed at Gahinga Lodge just over the border in Uganda, my attention had been drawn to the Volcanoes (Safaris) group of lodges. Her photos were stunning and she did a writeup about her trip for this site. The folks at Virunga Lodge in Rwanda saw the writeup and got in touch offering me a free stay at their place in exchange for a similar writeup. Score! They finished up some renovations in March and I ended up spending a night there last week. Having visited their lodge in Bwindi Impenetrable Forest in Uganda, I had some high expectations. 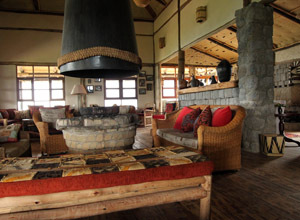 That place is beautiful and their offering at Virunga Lodge is just as good. The drive from central Musanze takes about 45 minutes with about half on tarmac and half on a well-maintained dirt road that just keeps on going up and up and up. If you don’t have your own transport, taxis can be hired in Musanze for around Rwf 15,000 one-way (a taxi can make in in good, dry conditions but during the rainy season you might need something more robust). The lodge is at the very top of the hill and their eight bandas are positioned with four facing the volcanoes and four facing the lakes – all with stunning views. The bandas are like little cottages with wood, stone and lava rock featuring heavily in the design. The banda I was in had two good-sized twin beds and loads of space. There was a huge balcony, part covered and part open just in case the sun decides to come out. Except for the view in front (you even have a fantastic view while sitting on the toilet – a bonus! ), the whole area around the banda is full of trees and plants and it really feels like you’re there on the hillside all alone despite there being eight cottages leading up the hill to a central building. The main building is stunning as well, equipped with plenty of fireplaces, couches, chairs on the surrounding patio with amazing views. There are lots of great little sitting areas scattered around the place too if you’d rather do your own thing. We were the only guests there when we stayed but if there are other guests, you’ll eat dinner together at around 7pm and can decide when you’d like breakfast. The wake up call with coffee, African tea, tea or hot chocolate served in your room was a nice touch. Overall the food was pretty good. We had lunch waiting for us when we arrived. Some sort of meaty lasagna type thing but with peas and a nice avocado salad. Dinner was a choice between a few options. The starters were French onion soup (which we both opted for and it was tasty) and smoked salmon. The main was a choice between chicken stuffed with mozzarella and wrapped in bacon, pork chops with a pineapple sauce (which we had… again, pretty good) and curried vegetable skewers. Dessert was a brownie with nuts and cream. 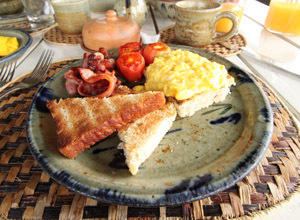 Breakfast is your choice – everything from bacon and eggs to oatmeal to Weetabix – served with tea, coffee and fresh fruit and juice. The food isn’t anything fancy but it’s good and the servings are large. Staff are on hand in case you want drinks throughout the day. Service is really good. They seem to think of everything and it’ all those nice little touches that make you realise you’re in a place that’s a cut above the rest. The wake up call with hot drinks, the hot water bottles in the early evening to warm your bed, the toilets with a view… it’s those little things that add up to a really great experience overall. There’s not so much to do up there on the hill and that’s how I like it. But for the more restless people who are able to tear themselves away from great views, there are a few options. They help out a local school financially and you can take a walk down to visit it. Or there’s a 3 hour round trip walk down to the lake and a few other short walks, gorillas of course, golden monkeys and whatever else there is on offer in Musanze which is about 30 minutes away. 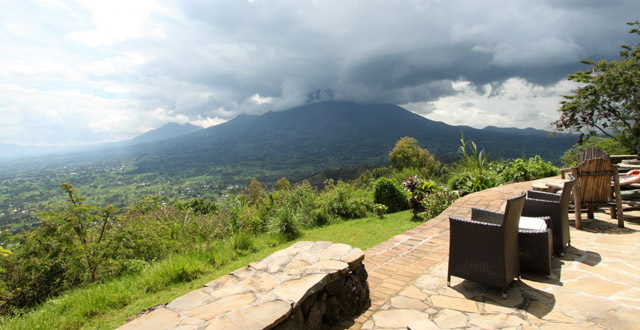 Normally a stay at Virunga Lodge costs over US$700 per person sharing but their resident’s rates make a stay here a lot more affordable for those of us who live and work in East Africa (and have the visa to prove it!). Residents of Rwanda pay $280 a night (please check their website for current resident’s rates) per person which might seem pretty pricey at first until you consider that this includes all of your meals, unlimited pop, tea, and coffee, two drinks at dinner (wine – from a bottle, none of that boxed stuff – or beer) and one complimentary massage during your stay. Add onto that the great service, amazing views and beautiful bandas and I think it’s good deal. If you can get 8 people together then you qualify for the group rate of US$210 per person which is an amazing deal. All bookings are subject to availability and need to be made directly with the reservations office located at Hotel des Mille Collines (+256 (0)252 502 452 or email them at salesrw@volcanoessafaris.com). Given that the lodge is pretty close to Kigali, it makes a great escape… no need to travel all the way down to Nyungwe Forest Lodge for exceptional service. I think get getting a group together and taking advantage of their residence rate would make a really fun, easy escape from Kigali. I’m already planning my return trip! Kirsty, are children allowed there? I think this place has some of the most stunning views in Rwanda (and that’s a high bar). The lakes, the volcanoes all in a row – I often took visitors there just to have a drink and admire the view on the way to/from gorillas. 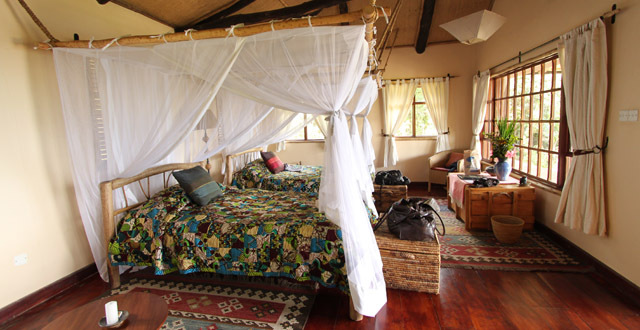 Children are also allowed to stay at the magnificent Virunga lodge.